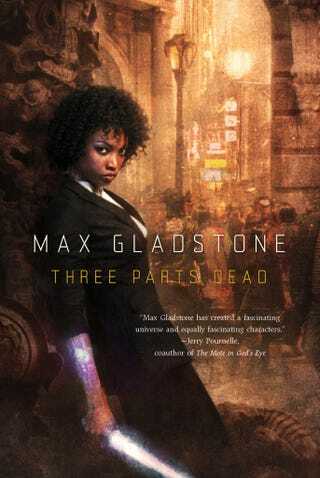 Max Gladstone's Three Parts Dead is the fantasy novel I was waiting for without ever knowing it. For all of us who love fantasy but feel that even some of the newest, freshest authors are falling back on old, repetitive ideas, this the book to pick up. Gladstone plays with fantasy conventions without falling into the comforting traps of genre tropes. The result is one of the best debut fantasy novels I've read in years. Tara Abernathy has just been tossed from the Hidden Schools — literally. They float hundreds of feet above the ground. A few weeks after this fall, Elanye Kevarian, otherwise known as ‘Boss Lady', shows up at her parent's farm with a job offer from the prestigious firm of Kelethras, Albrecht and Ao. It sounds great except that her first assignment will also be a test that could easily end in death for Tara. The job? Assist Ms. Kevarian in resurrecting Kos Everlasting, formerly the last living god in the West. Gladstone has done a lot of thinking about the power that gods and humans who perform magic wield, as well as the interactions of power. In this world the power of Craftswomen stems from the same source as that of the gods. When the gods saw the mistakes the human Craftspeople are making, the gods come down to the physical realm to ‘take care of it'. The Craftspeople fought back and the gods were slaughtered. As a result, while the eastern part of the world still has gods, the cities of the west have none. With the exception of Alt Coulumb in the city of Kos Everlasting. Kos is the last living god in the west who survived the war by Switzerland-ing the whole thing. Except Kos has just been murdered. Thus begins an entertaining and intelligent story that's equal parts action-adventure, fantasy, culture clash, mystery and courtroom drama. It's a common fantasy trope that supernatural beings get their power from the belief of humans but Gladstone's world takes that one step farther. While belief and worship are enough to sustain a god, most of their power comes from power loans written up in contracts. So let's say you're a god, and another god or Craftsperson would like to be able to call on your personal energy if necessary for defense of their land. A contract is then written up where you agree to allow them to use up to 10% of your total power, under very specific circumstances. In exchange for this the other god feeds you a constant trickle of power over the five years of the contract that ends up with you gaining something like 15% overall. So they get a pool of power to call on in emergencies and you get a larger power base in the end. As a result Craftspeople end up being part necromancers, part lawyers – they write up the contracts and if necessary enforce them, for both sides. This interesting idea in power-sharing ties into the overarching mystery of the book. Ms. Kevarian and Tara may be working for the priesthood in this resurrection bid but Kos also had creditors, those he owed power to who thus also have a vested interest in Kos being resurrected, according to their personal specifications. The opposing counsel is someone both Tara and Ms. Kevarian's have history with who may be too powerful to defeat and is legally allowed to oppose them at every turn. This added some twists to what I otherwise saw as a so-so mystery plotline and made every magical battle and odd yet appealing mix of traditional mage battle and a courtroom drama. The greatest strengths of the novel lie in the characters and worldbuilding. Tara's allies in her mission include Abelard, a chain-smoking priest of Kos; Catherine Elle, one of the Blacksuits, the cops of Alt-Coulumb who are possessed by the spirit of justice; Shale, a fugitive gargoyle; and Raz Pelham, the vampire captain of a pirate ship. If that sounds like an odd mix of beings, you're absolutely right and that's one of the strengths of this book. Gladstone throws you into his world headfirst and there is a lot of history that the reader does not know. One of my main criticisms is the pacing the beginning of the book, which can make the full immersion of the world a bit more difficult to take. The first chapters are a little confusing. But once Tara and Mrs. Kevarian actually arrive in Alt-Coulumb, the story finds it's rhythm. It is well worth pushing through the initial confusion because the world being built around the reader is so interesting you're more than willing to give Gladstone all the time he needs to tell you the story of this world. The setting has elements of traditional fantasy lands but also more than a few hints of an industrial revolution: the city Alt-Coulumb is run on the steam and heat their god generates, so there are also very minor hints of steampunk. Unlike most novels that delve into the interplay between fantasy and industry Gladstone does not focus on a thinly veiled London. Instead this is a world where industry is fueled by a mix of religion, magic and atheism. It's set in a godly city in a godless country. Tara lives in a word of flight by magic, where craftspeople can manipulate their souls to affect the physical world, where people gather world news via magic for publication. Having been born at the end of the war that wiped gods from the west she's never had any experience with higher beings or worship except in theory. So it's interesting to see her react to a city that she views as backward by virtue of them being believers in Kos while at the same time it's made clear that Kos has given them innovations, such as taxis and nightclubs, that Tara has never experienced before. I appreciated that during the religious clashes and discussions it was always clear that the opinions were those of the characters. Gladstone makes an effort to not present either side as fundamentally right or good and never does it feel as if he himself is taking a side. Since this is a trick that cam elude some of the most established and seasoned authors it was immensely refreshing not to have the author's politics overshadow those of the character. Fans of genre-bending pulp, courtroom dramas, well-built worlds, interesting characters and new paradigms of magic and power will be just as pleased by this book as I was. And just as anxiously awaiting Gladstone's next one. Max Gladstone is currently on a mini-tour of California. Check him out. He'll be at Borderlands Books in San Francisco on November 17th and Mysterious Galaxy in Redondo Beach on November 18th.